As Startling as Your OWN Scream in the Night! Dr. Arthur Hohler: For the past year your husband has had hypertension that complicates matters. Eleanor Johnson: Hypertension? What causes that? Dr. Arthur Hohler: Well, I'm not sure. My guess is overwork, unhappiness, anxiety. But you know more about it than I do. Eleanor Johnson: Why should I? Eleanor Johnson: Oh, yes, I'm that bitter, selfish, vicious wife. The cause of his unhappiness. The cause of his failure. Is that what he told you? Is that what he tells everyone? Woman on the Run has some wonderful scenes. Ann Sheridan plays a disenchanted wife whose husband was a witness to a gangland killing (while walking his little dog). Realising that he is in great danger the man goes into hiding (without the dog). Right from the beginning the noirish drama is mixed with hilarious humor. The police officers who come to the Sheridan character's house after the incident are cheeky and mean to the extreme. The woman who for some reason is treated like a suspect even has to open all her kitchen cupboards (I won't tell you what's in it, it's very telling and absolutely funny). Many aspects of the script do not stand up to logic. But, well, it is "only a movie" and therefore it does not matter at all  quite on the contrary in fact. Alfred Hitchcock must have run this one in his screening room more than once. The finale in a funfair has a strong resemblance with the one in his Strangers on a Train, released one year later. It has an astonishingly well done nightly rollercoaster scene. Furthermore there is some very good location shooting on the streets of San Francisco. 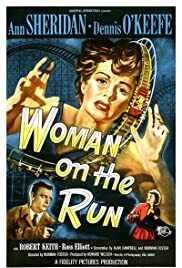 I can highly recommend this well fotographed and directed movie with good performances, especially by Ann Sheridan.